We are one of the coveted organization, involved in manufacturing, supplying, and exporting a gamut of Surgical Gloves. These gloves are manufactured using superior quality rubber and modernized machinery. All our gloves are immensely used in hospitals, nursing homes, dispensaries, and private clinics. Our products are widely acclaimed in the industry for its various features such as providing high protection level against infection and softness. Our clients can avail these gloves from us by paying through varied simple modes as per their ease. 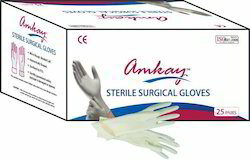 We are one of the renowned manufacturers, suppliers, and exporters of Non Sterile Surgical Gloves. These gloves are manufactured using optimum quality natural rubber in compliance with industry laid norms and guidelines. All our surgical gloves provide high level of protection to surgeons and nurses during operating procedures. Our non surgical gloves are developed with a powdered coating which provide high level of comfort to users. Our Latex Gloves are made of Natural Rubber with Micro Rough Surface at palm with pre powder to provide comfort to surgeons and nurses during operation procedures.